With the usage of progressive technology and innovative machines, we offer a broad assortment of Single Herb Capsule to our clients. Hadjod having Sanskrit name, asthisamharaka, literally means 'protecting bones from destruction'. It also known as Cicssus quadrangularis is named so because of its characteristic property to help in proper healing of bones and union of bones in fracture. It is mainly used as healer of bone fractures. It is one of the very frequently used herb by traditional bone setters of India. Hadjod are used both internally as well as externally in treatment of bone related troubles. Hadjod should be taken to fasten the healing process and union of bones in fracture. Hadjod is very beneficial to prevent age related changes in bones like osteoporosis. Hadjod also corrects the metabolism and helps in removal of unwanted fats from the body. It has fracture healing properties. It gives tensile strength to bone and increase bone formation and fasten the fracture healing properties. It relieves pain and inflammation associated with fractures. 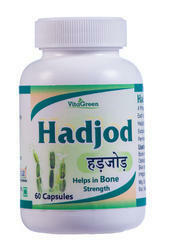 Hadjod is also recommended in old age to prevent age related changes like osteoporosis. Hadjod increases bone mineral density by stimulating bone metabolism and increasing the uptake of minerals like calcium, phosphorus, sulphur, and strontium by osteoblasts (bone-forming cells). The action is also helpful in preventing osteoporosis-related fractures. It also corrects the working of digestive system and nourishes the reproductive system. Two capsules, twice a day before meals. Jyotishmati capsule is a mood alleviator, good brain tonic. It is very effective in increasing memory and strengthens the mind. Improves memory and cognitive functions. It is beneficial in neurological diseases and pain disorders including muscle cramps, backache, sciatica, osteoarthritis, facial paralysis and paralysis. It improves functioning of brain and also strengthens the mind of the person. Helps to cope up with physical and emotional stress and is a mood alleviator. It has been reported to show a significant reduction in anxiety and depression. It is also used to increase memory and is good for brain and is a liver tonic. Haridra Herbal Capsule (Turmeric Herbal Capsule) is a pure herb extract. Turmeric is a herb that is used extensively in south asia as a food ingredient as well as a medicine. The many health benefits of Turmeric are attributed to Curcumin an ingredient in Turmeric. Turmeric has been a traditional household item for centuries and is often used in conjunction with Neem as a purifying herb that promotes healthy skin through systemic blood purification. Haridra is an herb that has a distinct yellow color and a pungent flavor. Its versatility in medical application makes it one of the most researched herbs of this era. Haridra also helps overcome allergic/ inflammatory skin conditions. The anti-inflammatory and antioxidant properties of Haridra assist in preventing the progression of diabetes related changes in organs like the kidneys, retina, nerve cells and minute blood vessels in the body. The plant Tribulus Terrestris, known as gokshura in ayurveda, has innumerable medicinal properties. 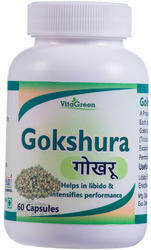 Herbal remedy gokshura contains natural properties and promotes proerectile function. Gokshura is useful in depressed libido. Gokshura increases male hormone which increases strength of muscles. It is also a strong herb for low libido and most highly it used as uro-genital tonic . Gokshura can also lower cholesterols levels in bloodstream and it has potential antioxidant properties. Gokshura improves the desire and drive, and subsequently improves the performance. It increases strength of muscles. Gokshura increases male hormone. It cleanses the bladder and boosts the resistance of bladder to infection. This property is very useful in treating cystitis. Gokshura acts as a very effective. Its having a property of boosting level which help to increase erection, count and motility. With the scientific name of Bacopa monnieri, this creeping, perennial Herb has been praised in Ayurvedic and traditional medicines across the world for generations. It has long been used in Ayurvedic medicine to increase focus and retention. Some of the organic compounds in brahmi stimulate cognitive pathways in the brain to boost cognitive ability. Brahmi has an ability to reduce the onset of cognitive disorders such as Dementia and Alzheimer’s disease. Research has shown it to be an effective way of stimulating the creation of new neural pathways and lowering oxidative stress in the brain, which keeps our minds sharp well into our old age. The leaves of the brahmi plant can be chewed (only 2-3 at a time) in order to relieve stress and anxiety The active ingredients in this herb can affect hormonal balance in the body and positively impact the balance of stress hormones in our body, thereby inducing a calm, relaxed state in a natural way, avoiding the side effects of traditional pharmaceutical options for stress and anxiety relief. When the leaves of the brahmi plant are rubbed topically on affected parts of the body, the compounds released can reduceswelling and eliminate irritation, as well as inflammation inside the body as well. This is ideal for people suffering from arthritis, gout, and other inflammatory conditions. Maximum strength. Carbohydrate blocker. Healthy weight loss. Glucose control. Kidney Bean from Genetic Solutions is a pure extract of Phaseolus Vulgaris, which is a highly nutritious. Combined with regular exercise and a healthy diet, this kidney bean supplement can help you maintain a healthy weight. Pippali, Piper longum also termed as long pepper is especially useful in respiratory problems. It encourages Broncho-dilation and improves blood circulation in lungs. Pippali increases the fire content of the body and an increased metabolic rate which works in burning of extra fats from the body. Pippali is also of great use in liver and spleen disorders. Gurmar has been historically used to manage healthy blood sugar levels. This has been backed up with numerous modern studies demonstrating its positive effect in neutralizing the cravings for sweets. It is considered to have stimulating, laxative and diuretic properties. As the name Gurmar (Sanskrit Name) itself means Sugar Killer. Gurmar (Gymnema Sylvestre) helps to maintain healthy sugar level in the body that is already within normal limits. ... So the herb which kills the sweet taste is known as Gurmar. When you chew the powder of Gurmar you will lose the sensation of sweet taste. Description: Gajar Beej include freshly ground, whole herbs and super foods so you can produce the finest quality supplements. The seed is used for severe diarrhea (dysentery), indigestion, and intestinal gas. Women use it relieve pain in the uterus and to start their menstrual periods. Bala is an herb which gives the Bala - the strength to the body. Bala increases the vigor and vitality because of Bala's Vata balancing properties. Bala nourishes the body improve working of the digestive system and imparts healthy complexion to skin. Helpful in general debility, tuberculosis and undernourishment. Used in anti-inflammatory and in urinary and uterine discharges. Useful in Strangury and Hematuria. Forskolin ignites the body's metabolism to help burn off excess fat, natural organic herbal weight loss appetite blocker. May double weight loss possible with diet and exercise alone. Forskolin is a useful ingredient for weight management and unwanted fat-reduction from belly, thighs, hips, and arms, chest as well as everything in between along with good diet and exercise. It will help manage your appetite, yet feel as full for longer. Description: Mandukaparni also known as gotu kola (Latin name: Centella asiatica) it is a brain tonic, that helps in improving memory, intellect and overall brain functions. It is also excellent in supporting and toning varicose veins and in blood circulation. It is also an herb recommended in the treatment of psoriasis. Provides vascular support and helps in soothing and minimizing varicose veins. In a study of people with varicose veins, ultrasound examination revealed improvements in the vascular tone of those who took gotu kola. Draksha contains Proanthocyanidin. It is a rich source of Anti-oxidant and Polyphenols. It has a superior ability to protect cells against lipid peroxidation and DNA fragmentation. We offer Tulsi Herbal Capsule which helps suppress cough and aids the mobilization of mucus. The oleanolic acid, ursolic acid and polyphenolic constituents in Tulsi help in alleviating allergic or infection induced airway inflammation. In conformity with the concert of international quality standards, the offered capsule is processed using high quality natural ingredients and advanced processing technology. The leaves strengthen the stomach and induce copious perspiration. During the rainy season, when malaria and dengue fever are widely prevalent, Tulsi act as preventive against these diseases. Basil has strengthening effect on the kidney. Applied locally, basil juice is beneficial in the treatment of ringworm and other skin diseases. Tulsi is a rich in antioxidant and renowned for it's restorative powers. It is useful in many diseases like malaria, heart disease, headaches, stomach disorders, kidney stones, heart disorders, and many more. Tulsi contain hundreds of beneficial compounds known as photochemical, these compounds possess. strong antioxidant antibacterial, antiviral, adaptogenic, and immune enhancing properties that promote general health. Guduchi is strong immunostimulant and its having immune-promoting qualities which help in cancer. Guduchi is an excellent herb to take as an immune booster and general tonic. It increases body energy level. It having anti-microbial property which inhibits growth of microorganisms in body. This boosts body resistance to diseases. This wonder herb helps immensely in diseases of joints like arthritis and gout. Guduchi helps to purify blood and expel the toxins which are circulating in it; because of this property it is useful in gout to control blood uric acid level. Due to properties it increases count and motility. Guduchi helps in increase the body's own defence mechanism. Guduchi having ability to impart youthfulness, vitality and longevity to the human body. it also increases strength. It is well known as a greatest herb for clearing the micro-circulatory system and other bodily channels. Guduchi is also used for treating gout, malaria, fevers, neurological diseases, rheumatoid arthritis, vomiting, diabetes, syphilis, excessive thirsty, menorrhagia, and it stops bleeding after child birth. Kali musli is the name of Curculigo orchioides in Hindi. The shrub is highly beneficial for a number of ailments. Kali musli is a perennial shrub and has elongated and short fleshy roots. Its rhizome is 1 feet in length and pulpy.